Why does a history professor decide to write a novel about witches? It's a good question! Writing a novel is a mysterious process and many of my life experiences went into A Discovery of Witches. One of my favorite books as a child was Elizabeth George Speare’s The Witch of Blackbird Pond. The history of alchemy and magic caught my interest as an undergraduate, and I'm still fascinated by these subjects today. And, once upon a time, I discovered a lost alchemical manuscript—although it was not (so far as I know) enchanted. A Discovery of Witches tells the tale of a reluctant witch named Diana Bishop and her discovery of a long-lost alchemical manuscript at Oxford’s Bodleian Library. There, Diana meets Matthew Clairmont: a geneticist who happens to be a very old, secretive vampire. Witches and vampires are traditional enemies, but Diana and Matthew grow closer as they try to puzzle out the manuscript's significance. Their search for answers takes Diana and Matthew from Oxford, to his ancestral home in France, to her family’s farm in upstate New York. But they are not the only creatures who want to solve the mystery of manuscript, and their fellow daemons, vampires, and witches frown upon their unorthodox relationship. Are these just old prejudices, or is it something more? Our culture’s renewed obsession with witches, vampires, and other things that go bump in the night has been fascinating to me as a historian. I’ve gone from needing to explain what alchemy is to having my students all nod wisely whenever Nicholas Flamel is mentioned. Parents have confessed that they've been staying up late to read their kids’ copy of the latest Harry Potter. Our reading habits reveal that even grownups need a little magic—with the limitless possibility, unpredictability, and even chaos that inevitably comes with it. My goal with A Discovery of Witches was to write a fairy tale that was mesmerizing but spoke to adult issues and concerns. I tried to create characters who were strange—yet strangely familiar. Many of us will recognize ourselves in Diana, who has so much power but is afraid to use it. Others will empathize with Matthew’s inability to let go of his 1500-year past—even though we have less of a past to worry about! And still more will wonder, while riding the train or sitting in a meeting, if that strange creature opposite just might be a daemon or a vampire. It it's magic you need this winter, I hope that you find some in A Discovery of Witches. Penguin is offering a lucky reader a copy of A Discovery of Witches! Thank you for having Deborah Harkness here & thanks to Deborah for the interesting post. Thank you for the synopsis & the video too. Hi hon!! 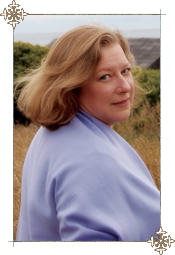 Thank you for having Deborah Harkness join us on your blog by guest posting!!! This is definitely a book on my list to read! I won't enter the contest because I have already won another on your blog, and would like others to have a chance. Thank you for sharing!!! Take care and have a fabulous weekend! got my attention. I am loving witch stories right now. Thanks for the chance to win! Great guest post. This book looks pretty interesting, too! Thanks to you and Penguin for the great giveaway! I've heard of this book and have been really interested in reading it! Thanks for the giveaway! This books comes out in Norway soon, and I am so eager to read it. Loved the post! Love this post and I am DYING to read this one...keeping my fingers crossed! !